The attacks by the Arakan Army reveals a deeply divided state, which has been marred by various other ethnic conflicts. It also highlights the complexities that trouble the Rakhine region. The Rakhine state is most associated with the Myanmar government’s persecution of the Muslim Rohingya. In 2017, the government there began a crackdown on Rohingyas which led to 700,000 of them fleeing from Rakhine state. It is reported that the actions of the Arakan Army were in retaliation because police units there were assisting the Myanmar army (better known as the Tatmadaw) attack the Arakan Army in December. 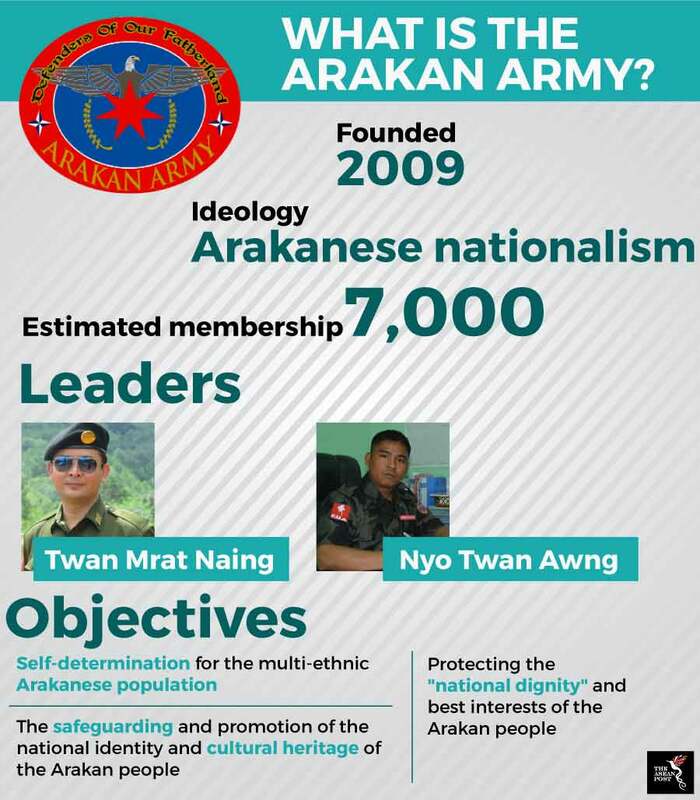 Founded in 2009, the Arakan Army is the armed wing of the United League of Arakan. The army was established near the northern border of Myanmar and China where the Kachin Independence Army (KIA) operates. It is believed that the early members of the army were ethnic Rakhine Buddhists who were working in the jade mines there. Most of its members are made up of ethnic Rakhine Buddhists and among their main aims is to establish independence and autonomy for the Arakanese people. Media there have estimated that the army could have as many as 7,000 members. The Arakan Army and its affiliated parties have long called for independence and self-determination, claiming that the Myanmar government has failed in protecting them and their interests. Despite being rich in natural resources, Rakhine is one of the country’s poorest states. Ever since the attack, the government has further antagonised the Arakan Army by deploying more troops in Rakhine State and warning of an imminent crackdown. Some have pointed out that the government is treading new ground as this would be the first time it has directed the Tatmadaw, a supposedly independent arm of the state as mentioned in the country’s constitution. U Zaw Htay also told the Rakhine people to stop supporting the Arakan Army and went on to suggest that the Arakan Army was working with the Arakan Rohingya Salvation Army (ARSA), the only officially designated terrorist organisation in Myanmar. A claim the Arakan Army has vehemently denied. Many observers have denounced the rhetoric of the Myanmar government as it could further complicate peace attempts. The Arakan Army is one of 11 ethnic armed groups that have not signed the government’s October 2015 nationwide cease-fire accord. By designating them as terrorists, the Myanmar government could excuse itself from negotiating a ceasefire and instead continue the violence under the guise of “counter-terrorism”. The Arakan Army also has the large backing of the people in Rakhine state and any further antagonism could only strengthen their loyalty to the army, which could further intensify clashes between the Arakan Army and the Tatmadaw. The Rakhine state government has implemented a ban which prevents humanitarian aid groups from entering villages in Rakhine due to “security concerns”. In response to this, the United Nations (UN) has called for both groups to protect citizens and called for “rapid and unimpeded” aid access to Rakhine. In addition to that, the UN says that more than 5,000 people have fled their homes since the fighting began earlier this month. While the actions of the Arakan Army may be questionable, the strong response from the government has caused misery for its own civilians. Any increase in hostility will only result in retaliation, ensuring a circle of violence where ultimately civilians will suffer.